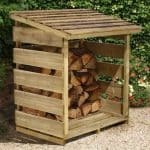 Being sold at a fantastic price, the Forest Garden Log Store is one of the better log stores that is on the market right now. This is one very smart looking log store. It has been designed to have a somewhat rustic look and we think that it really does make the structure stand out. The 6 x 3 nature of this log store means that you will be able to fit a whole load of logs in here. It also is much higher than the photos suggest, as this stands at just over 4 feet tall. This means that you will be able to stack wood up pretty high so you can get a really impressive log stockpile in here. This is one of the better made and lower priced log stores that we have seen. The whole structure is made with high quality wood. Wood that has been pressure treated so you are going to get many years of use out of this log store. 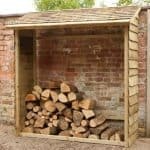 It is also very low maintenance as there is no need to treat the log store on an annual basis like many others need you to do. With slatted sides, back and even a slatted floor, plenty of airflow is going to surround your logs and make sure they are in as good a condition as possible before you need to use them. The Forest Garden Log Store really does have everything that you would want in a log store. We really like the way that this is made and feel that the rustic look that it has really will make it look fantastic as it stands in your garden. Even when this is empty and has no logs in it, we feel it will look very nice. It is a very decent size for a log store as the width is 6 feet and the depth is 2 feet 8 inches. This can hold a whole lot of wood, which you can actually see from the pictures. We also like how it is 4 feet 2 inches high so you can pile up your firewood pretty high. They have gone for a pent slatted roof and we think that they have done an incredible job with this roof. The slatted design of the roof looks awesome and it is going to keep the wood protected from the rain. The roof also has a very good overhang which will prevent the rain from running off the roof and onto your precious firewood stockpile. One thing we must say about the roof is that we did read a few reviews where people said they felt the screws that came with the roof were not enough, so they had to add a few more. So that is something to keep in mind. Like most other log and firewood stores, the Forest Garden Log Store does not have what you could call traditional cladding. The sides and the back of the log store are made with very thick and chunky slatted pieces of timber. These are slatted so that air can get in and around your wood which will help fight off moisture and condensation. One of the most interesting design choices of this shed is that there is not actually a frame inside the log store. This is because a frame is really not necessary. The way this log store screws together takes away the need for a standard frame. 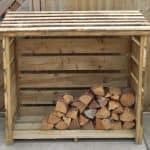 We actually like this as the structure is solid enough without one and a frame inside the log store would just eat into your storage space and probably add a few pounds to the overall price. None of your logs will be sitting on the floor with this log store. Instead they will be sitting on a slatted floor. 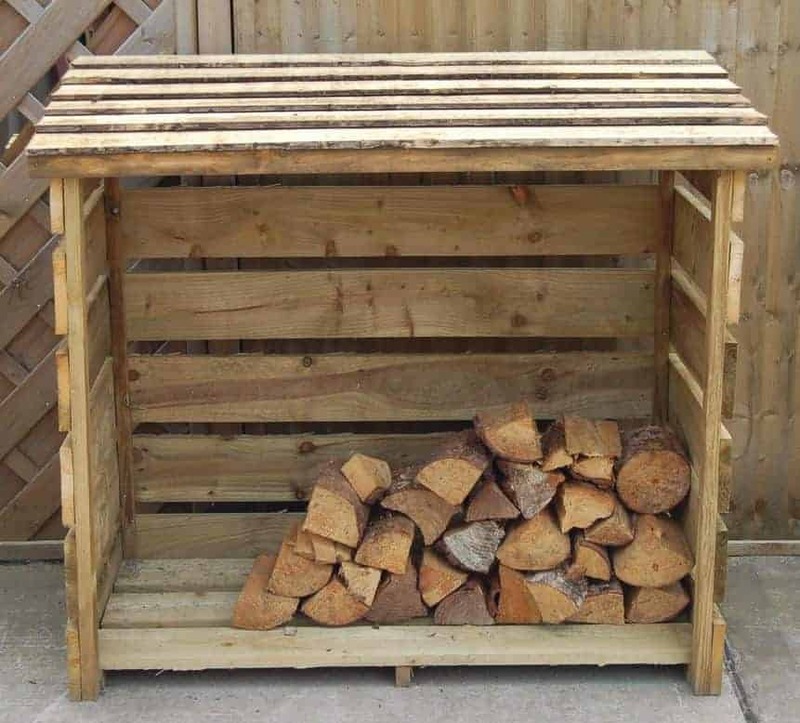 We really like this as it is nice and airy so you do not have to worry about too much moisture build up on your logs. Also, it looks great and fits in with the rest of the structure very well. The wood they have used is thick, so even when you throw your logs in here the floor will be fine. We had to check a few times to make sure we were reading it right, but the Forest Garden Log Store is made with pressure treated wood. At this price point, pressure treated wood is just incredible and it is a very welcome bonus. The wood being pressure treated means that you will never have to paint the log store with wood treatment. 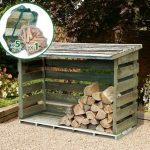 As this is made with high quality wood that is pressure treated, this log store comes with a generous 15 year anti rot guarantee. Best of all, as the wood is pressure treated, the guarantee is valid from the moment the log store is delivered, whereas log stores that are not pressure treated will have to be treated first before the guarantee is valid. There is no door on this log store and we are fine with that. We know that for many people they want easy access to their log stockpile. Last thing you want to do if it is raining or snowing is mess around trying to open and close a door, especially when you are trying to hold a few logs at the same time. What the idea of this design is, that you simply just need to reach in, grab a few logs and go on your merry way. As the whole front of the log store is wide open, you do not have much (if any) security with this log store. To be honest with you, the chances of someone stealing your logs are pretty low and the majority of log stores you will find have a similar design to this, so we will not be too harsh on it. But if you are a person who is security conscious, the fact that this log store is wide open is something you will have to come to terms with. They are not offering any customisation options with this log store. When we think about it we are not even sure what they could offer as customisation options. This is a log store that looks great the way it is, so we are not sure we would want to tinker with the design anyway. 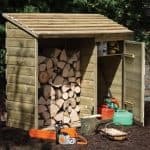 Like most other log stores we have looked at, the Forest Garden Log Store does not offer any extras. This is actually really good as it means there is more money in your pocket to spend on logs to fill this up. Or you could get the other half something nice, but we are sure she would really appreciate an awesome log store that is full of logs. This is a log store that has really impressed us. The quality of this log store is very high and when you consider the price they are asking for it, it does make it that extra bit impressive. The pressure treated wood they have used with this log store is sure to last you many years. In all honesty, it is not an exaggeration to say that this log store will give you a lifetime of use. This is actually one of the more spacious log stores that we have seen. The storage space that this offers is actually very impressive and will allow you to build up a very large stockpile of wood. This is said to be an easy installation job, but just watch out for the roof. It might be a good idea to buy a pack of wood screws just in case you do feel that the roof needs a couple more. Apart from this though, installation is a very straightforward process with this log store. 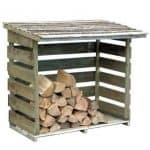 We had to score this a ten as just over £100 for a log store of this quality is incredible. Also, as of us writing this review, if you were to order online they are giving you an extra 8 percent off! So if this is on your watch list and the offer is still on, do not mess around and go get that extra 8 percent off. Final Thoughts: What at first glance looks like a rather basic log store, the Forest Garden Log Store the more you look at it, the more it impresses you. We really are very happy with what they have done here. They have made a log store that first of all has a great look to it. We just love the rustic design and think that it is really charming. But they have also made this with as high quality materials as they possibly could. You get all of this for right around £100, which is just an incredible deal. If you want a log store, but do not want to spend a lot of money, then you will have a hard time beating this.